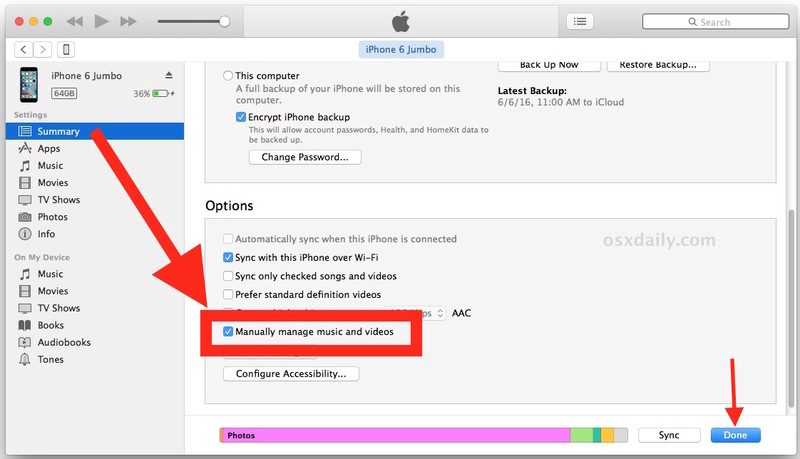 “How do I copy music onto my iPhone from iTunes?” is a fairly common question. Fortunately, copying music onto an iPhone from iTunes is fairly easy once you learn how to do it, though you’d be forgiven if you find the music copy process to be a little confusing at first glance. It turns out there are several ways to get music onto an iPhone from iTunes, but we’ll show you the easiest way which involves a simple drag and drop music transfer onto the iPhone. 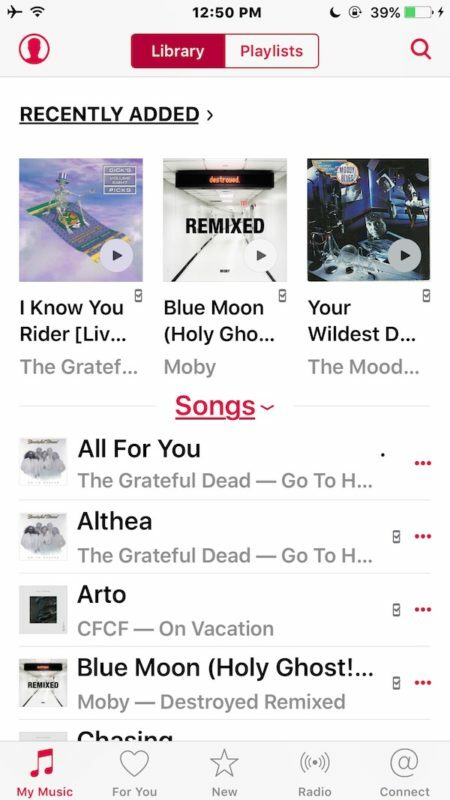 This method, which I think is the easiest in terms of behaving most like other computer interactions, allows for selecting music and dragging and dropping it to copy to iPhone from iTunes. This is not the same as the playlist sync method, since rather than creating music playlists in iTunes to sync to iPhone you’ll instead be able to manage music and copy on a per-song and per-album basis. * You can use Wi-Fi transfer as well if you have it setup, but copying music from iTunes is usually faster and more reliable with a USB cable connected to iPhone. ** Selecting an iPhone with iTunes 12.4 is less than obvious, here’s how to do it. That’s all there is to it. As long as the iPhone is connected to iTunes (by USB or wi-fi), you can drag and drop music onto the iPhone to copy it over from iTunes. To me this is much easier to explain and use than creating a new playlist that syncs but sometimes brings with it stuff you don’t want or the auto-fill weirdness, or a myriad of other potential iTunes headaches. Another perk to manually managing your music this way is that you can actually copy audio and music directly from the file system to an iPhone, without importing it into a iTunes Library first. Now you can enjoy your music on the go from iPhone, the easy way. Play it in a car, through headphones, stereo, any AUX hookup, or out of the little speaker, enjoy! 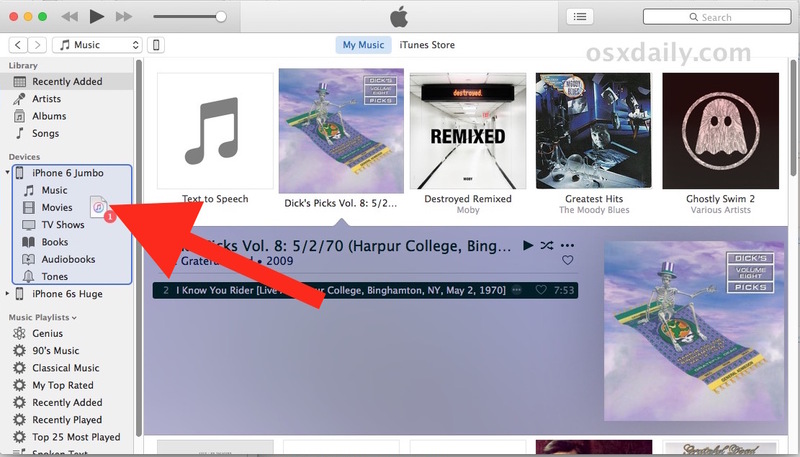 Does copy iTunes to iPhone also work for iPad Air 2 ? Yes John you can use iTunes with iPad and iPod too. I use it for iPhone but I don’t put music on my iPad. I stream Spotify and Pandora on iPad. Great tip. Thanks for the suggestion. My iPhone is now updating my albums from iTunes to my cell. How about going the other way? I have a new iMac and find that if I attempt to synch my iPhone music to via iTunes, I get a message saying that everything on my iPhone will be erased! No can do, sorry. Piracy reasons, apparently. You need to transfer your music library from your old computer, or better yet, clone your old computer to your new one using SuperDuper or CarbonCopyCloner, which then turns your new computer into an exact clone of your old computer, which your phone and any other iDevices will see as the same old computer. In addition, all your files, user settings, music et all will be on your new computer as well. Another common trick is to store the iTunes library on an external hard drive if you change computers often, works well and no performance hit since it’s just music. Transfer from iDevice to Mac or PC, search for senuti (itunes spelled backward). What about Voice memos? I’ve used the Voice Memo app in the past for everything like memos to keeping class notes, for lyric and song ideas and pretty much anything you’d use Notes for. One example, I often have song ideas that may start out in the Voice Memos app on the iPhone, but as I edit that file on a Mac I might want to a send it back to the phone for when I have later ideas away from the studio. Although not that hard, I never liked the way iTunes handled voice memos. It seemed convoluted and unsure, IMO. Maybe I should only use Music Memos from now on as it just saves everything to iCloud which works out nicely. Any recommendations for a voice memo app on the App Store that uses iCloud for exchanging files back and forth from iOS devices to Macs? I really like apps that set up their own folders on your iCloud folder and auto save them there. So easy. @Steve Steele – I discovered a few programs that give movement to my voice memos between my iPhone and my Mac for a small annual cost. AnyTrans, FonePaw iOS Transfer, iExplorer, TouchCopy16 and TuneGo are program which can help you transfer files between devices. TouchCopy16 is the cheapest of these six programs ($30 annually to use), but the other programs may offer more functionality, especially for what you’re looking to do with transferring back and forth.